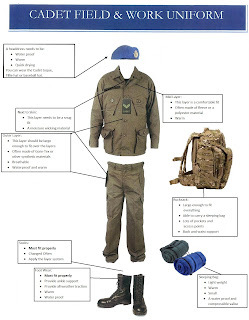 "CADPAT is the current CF field combat clothing uniform. The wearing of CADPAT clothing by cadets is not permitted in any circumstances. Cadets are authorized to wear the OG107 uniform (the former olive drab Canadian Forces field uniform) during sqn survival exercises when authorized by the sqn CO. Headdress (the blue beret with the Air Cadet hat insignia, wide-brimmed tan summer hat or toque) and cadet rank slip-ons shall be worn with the OG107 uniform. OG107 uniforms obtained by cadets for sqn training shall not be taken to CSTCs;"
Cadets are also encouraged to check out Poco Military, a local surplus store located in Langley, when looking for new gear. Any questions can be directed to Capt Groome at nathan.groome@cadets.gc.ca . **746 takes no responsibility for the content of external sites. ***this website is provided as a convenience only, this is not an endorsement.